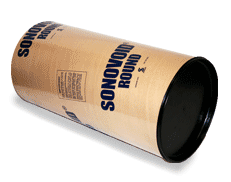 Sonotube concrete forms are renown for saving time and money. The stripping filamet enables quick cleaning and installation and Sonotubes are notable for providing srength and water resistance. We carry a wide range of Fibre Tube items including concrete void tubes, round finish free concrete column forms and round concrete column forms. We carry a range of sizes including – 24″ x 12″.